Annual Empty Bowls, Vendor Sale & Silent Auction! This event is in support of our local food banks within P.E.C., Quinte, and Hastings County. Gleaners Food Bank and Quinte Regional Food Share Program are teaming up with Loyalist College Culinary Program to put on our Annual Empty Bowls, Hand Craft Sale, and Silent Auction. Empty Bowls showcases the art, crafts, and pottery of our local artisans to help promote the alleviation of hunger within our community. 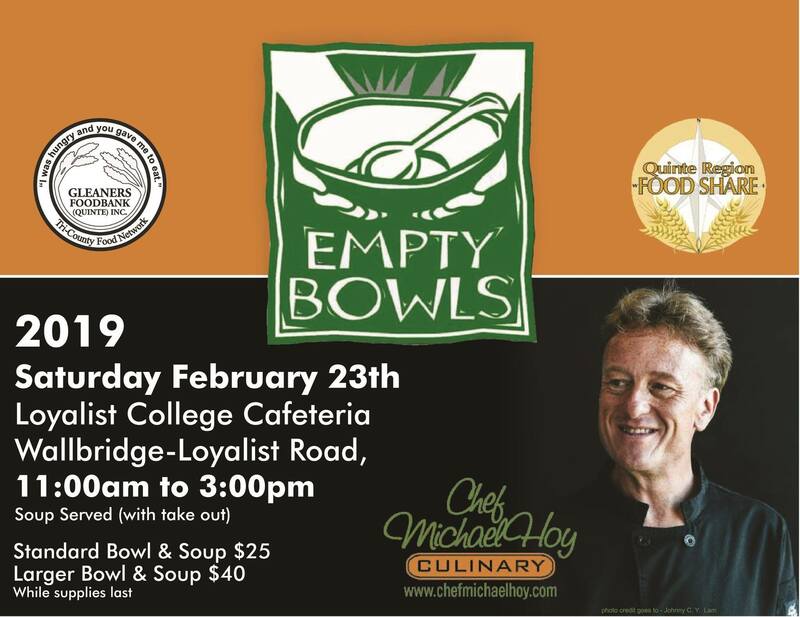 With supportive partners from the Loyalist College Culinary Program and Local Chef Michael Hay, they will be cooking up delicious gourmet soup. Event attendees are able to purchase generously donated beautifully crafted potted or wooden bowls with their choice of gourmet soup. Please join us for this wonderful event supporting local chefs, artisans, and of course your local food banks. We are still accepting vendor registrations!! If you are interested in getting involved, send us a message, and we will get you registered!! « Savour The Chill & Stay A While!